Littlehampton Wave has some of the best swimming facilities in the South of England. It has been designed to provide the best possible swimming experience for serious fitness swimmers, for families to enjoy swimming together and also to provide the perfect pool for children and adults to learn to swim. The centre boasts two swimming pools, including a large 25m pool plus a smaller training pool. The trainer pool features a moveable floor so it provides flexibility in its timetable to appeal to those learning to swim in shallower water to build all important water confidence. We host our swim lessons in both pools but our less advanced classes are held in the smaller training pool. If you just want to come and enjoy the water, then Littlehampton Wave is right for you. Swimming is a great activity for the whole family to participate in together. Have fun splashing around and practising the life skill of swimming. 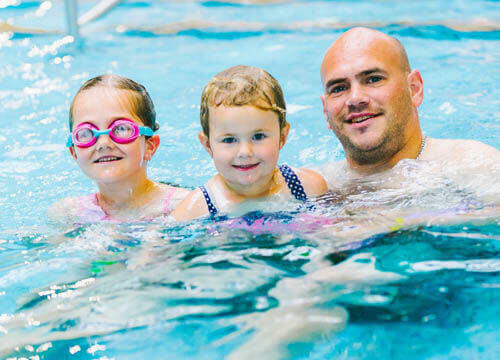 Cool down on hot days and enjoy a fun indoor activity in the cold wet months of the year, The whole family will enjoy the time spent together in the pool.